Books that might just change your week. The best story I ever heard in my life was told, over the course of a winter, to me and my sister Erin. When we were growing up, my parents rented out the back part of our house to friends, so we always had extra adults around. It was wonderful. When Duffie and Debbie lived with us, we would go next door what seemed like every evening to listen to a story that Duffie would make up on the spot. The upper floor of their apartment was a big room. It had wide, wide plank floors and a peaked ceiling. It’s still a big room, but in my memory, it is cavernous – an entire world. The story came with a map. Duffie drew it, a little bit at a time, on a plain, white piece of paper. It was an adventure story, a cross between Hansel and Gretel and The Hobbit, only I’m pretty sure that we (Erin and I) were the adventurers. There were bridges, forests, ogres, secret codes, and hidden passageways. When we had adventured all over one side of the page we crossed over to the other side, discovering new worlds as Duffie narrated and drew them. Sometimes we would double back. The story would make us return to places we had been before, and things would have changed. We were children, journeying through a strange world, but we had a guide in Duffie, who seemed to know the terrain and seemed never to run out of story. One night, on my birthday, we were invited over to Duffie and Debbie’s for supper AND stories. They didn’t have much of a kitchen, as I remember. They sometimes ate with us, but this night, Debbie made pancakes over a portable stove. The pancakes were small, fairy sized, and served with jam. It’s funny that it never occurred to us that they wouldn’t want us there every night. Here was a couple in their late twenties and every night their bed was invaded by children not his own. Well, even if they didn’t want us there, the story took over. Duffie knew it and so did we. Eventually, the story ended, as I suppose all stories must do. 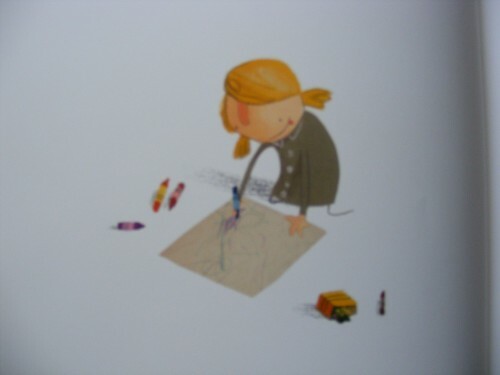 The map was full of drawings — roads, trees, bridges, inns, and caves that we had crossed and recrossed. The paper was pocked and hammered from being held in eager fingers, but the lines were crisp and unstained. When the story ended, it must have been a logical ending, because we didn’t feel cheated or anything. We all know a good ending when we hear it. But it was a crushing disappointment to know that that story was over. Worse still, it was an oral tale, told over an entire winter. The moment it ended it was as though all that was left was our memories — ephemeral childhood ones that we knew we had already begun the process of forgetting. Duffie had brought us through our quest intact and stronger — the goal of any good adventure story. He had left us with a longing for an experience we could never quite recapture but would continue hunting. The map remained, of course. I remember sitting in the bed, amongst the crumpled sheets, and trying to commit it to memory — the stories, the adventures, the places Erin and I had actually been, or so it seemed. The next night we begged Duffie to let us return to that world but, as I recall, he refused. His next story was about a donkey. I felt a sickening feeling wash over me when I realized it would never be as good. The story was gone. In its place was a craving (an addiction?) for stories. I still know it when I encounter it. You know it, too. The story that you don’t want to end. The story that your eyes race through to find out what happens, but where the language still sparkles and makes you look up from the page with wonder. That. And the books that you finish and start again, because you can’t bear to be outside that world. Sometimes you chase down stories by the same author but they’re never the same. I’m sure they knew it too, as they were writing. This. This is magic. I’ll be lucky if I can ever do this again. The idea for this post was suggested to me by my friend Alice in early October. She had noticed that in many books she was reading to her daughter, the word NO, or the denial of permission, was used as a plot device. Alice mentioned Robert Munsch’s use of “No,” NNNNno,” and “Nononononono” as a device in many of his stories. I didn’t know what to do with this idea when she proposed it to me. I suggested that she write a guest post, but I suppose that, given that she was working full-time, AND in her third trimester with her second child, AND the mother of a busy a one-year old, she just didn’t have the time. Anyway, I’ve been mulling over this idea ever since, and these are the musings I have come up with. One day, Thomas’ mother got him a nice, new, brown snowsuit. And when Thomas saw that snowsuit, he said, “That is the ugliest thing I have seen in my life.” But he put it on anyway. THE END. See? No story at all. This is the story of my life, by the way. “Oh no! – Not the lavender store-brand running shoes with velcro fastenings from Kmart! But I have no others… so I will wear them.” THE END. What is no, and why do toddlers make such copious use of it? No is an assertion of selfhood, right? When you’re a baby, you do whatever is done to you. You eat the food that comes at you, you wear the itchy sweater that your Auntie Matilda made for you. But when you get a bit older, you realize that there is this powerful word that makes grown-ups stop. No. What I am saying, I guess, is that the word “No” becomes the basis for an explanation, and also for a story. “No” inspires persuasion, tall tales, narratives. Obedient children make boring characters, too. Here, for example, is the story of Peter Rabbit‘s sisters. Flopsy, Mopsy, and Cottontail lived with their mother under the root of a very large fir tree. One day, their mother said “I’m going out. You may play in the meadow or down the lane, but don’t go into Mr McGregor’s garden. Your father had an accident there. He was made into a pie by Mrs McGregor.”* Their mother took her basket and went to do her shopping. Flopsy, Mopsy, and Cottontail went down the lane and gathered blackberries. When their mother returned, they had bread, and milk, and blackberries for supper. THE END. Peter Rabbit doesn’t say “No” to his mother, but his disobedience is a willful negation of his mother’s wishes. His disobedience is the story. Flopsy, Mopsy, and Cottontail’s story might be the moral, but it isn’t interesting. Readers might want to be the good sisters, eating their delicious meal at the end of the day, but they don’t want to read about them. Many parents (including myself) would doubtless like to shut down the “No” emerging from their children’s mouths. We’d love to have angelic faces beaming, with “Yes” emerging from cherubic lips. But that wouldn’t be very interesting, would it? And there would be precious few stories to share. 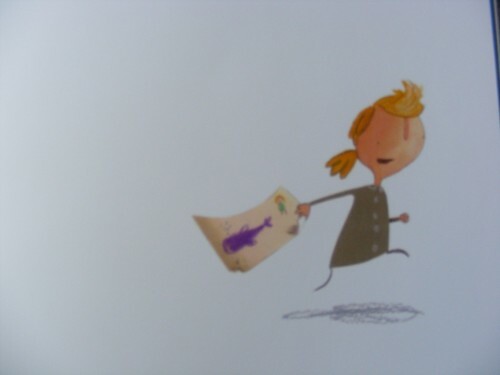 I love everything that Oliver Jeffers does. He manages to weave so much feeling and human truth into books for children that you actually feel wiser after having read them. Unlike Lost and Found, To Catch a Star, and The Way Back Home, this one is about a girl. (Sorry about the focus). What I find so beautiful is the way Jeffers evokes the passage of time here. The girl starts out making scribbles on paper and then those scribbles become a representation of what she’s been thinking about with her grandfather (they go to the seashore together; her grandfather tries to tell her about whales and she imagines elephants beneath the waves). Eventually, not only does she begin to understand what a whale looks like, but she can draw one. Her rush of energy (in the last image) is cut short when she arrives in front of an empty chair, the chair where she used to share ideas with her grandfather. The story grapples with the way some of us deal with grief. The girl bottles her heart inside herself, delaying (one assumes) her grieving, but at the same time preventing herself from continuing to learn and experience the world in the way her grandfather had wanted. It is not until she meets another young girl, a reflection of herself, that she is able to release her emotions and move on. The story is so richly symbolic that I think it will mean different things to different people (and at different points of life). What touches me is how the young child is able to free a frozen part of the older person’s personality, to reawaken her to wonder. I was by no means dead to the mysteries and magic of the world before I had Owen, but I have noticed that having him allowed me to shed some of my cynicism. Looking at the world through the eyes of a child (or alongside the eyes of a child) really can make the universe expand. Having to (attempt to) explain the world at all makes us more creative and imaginative, and reminds us of our own (lost?) sense of wonder. I gave my usual speech on plagiarism today in class, and I’m pretty sure got a little too philosophical. I was trying to get across the idea that we all build on the knowledge of others, and it’s by acknowledging where our ideas come from that we can create a path others can follow back to the roots of our ideas. By acknowledging our sources we can actually build knowledge on top of and around other people’s discoveries instead of just endlessly replicating the same thing over and over again. I know. I should have said “Don’t copy and paste from the Internet or you will fail.” But the propagation of ideas really matters to me and on the first day of class, I want to be inspiring rather than intimidating. 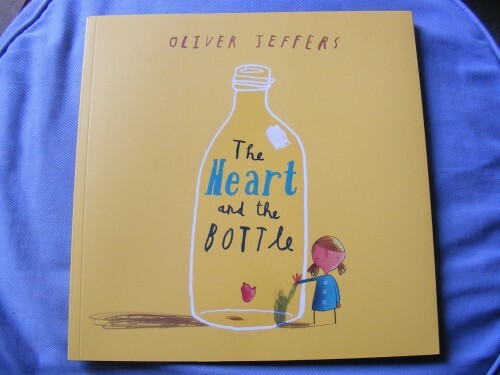 At its simplest, The Heart and the Bottle is about a girl who loses her grandfather and who eventually learns to honour his memory by pursuing his love of learning. At its broadest, it is about grief and loss, about the pursuit of knowledge through books and observation, and about discovery, self-discovery, and recovery. It’s about what adults can teach children and what children can teach adults in the endless cycle of life and learning. P.S. Jack Layton has been on my mind as I’ve been writing. I mourn the life cut short and the huge hole he’s left behind in Canadian politics. I hope we can all remember his message. The books Owen has been choosing lately are HIS favourites, not mine. There’s just not that much to say about soft dinosaur puzzle books, or books about French vocabulary, or books about what is wrong with little Pookie (though this last one is pretty fun to read with a responsive toddler). I’ve managed to slide in a couple of books of A A Milne poetry (and have also discovered how intensely disturbing some of the poems in Alligator Pie are – more on that another time, perhaps? ), but we’ve basically been doing the rounds of a bunch of books Owen loves and I… well… get bored with. No matter what we read, lately, Owen is concerned that the characters in question are happy (he is, after all, the Minister of Happiness). He has a Thomas the Tank Engine book in which Thomas crashes into the station master’s house. Thomas’s expression is one of dismay, but Owen points to it and says “happy?” and keeps asking if Thomas is happy right up until the end when he really is happy again. He also really relies on the pictures to let him know if a character comes out of hardship alive. Words alone will not convince him if the picture is of a monster running off with a crying mum. On that note, he actually bit my behind this morning… Uncharacteristic and surprising – he hadn’t bit me in a year or so. And a little painful. Anyway, he asked me right after I yelled at him if I was happy. “No,” I said. “Mummy’s not happy. Mummy’s sad because you bit her on the bum.” To which: “Mummy happy?” He still gets quite panicky when he realises that he’s upset us. He eventually hurt himself (not very badly) and started crying his eyes out. In the midst of his tears, he said: “Owen no happy. Owen sad!” and then, after getting verbal confirmation that I was again happy, he said (still crying, mind you) “Owen happy! (Waaah)” – quite the emotional roller coaster with this child. The other thing he’s doing with books lately is asking to take the characters “out.” It started about a week ago, quite out of the blue. He picks at the page, saying “out. out.” Of course, you can’t get the pictures out of books. And he’s surprisingly unimpressed with stuffed animals in the shape of book characters. He wants the picture, not the stuffed animal… obviously. In any case, at the end of our book reading sessions, every night, I’ve started telling Owen the story of his day (in part because sometimes he wants to read more and more and more books and I just need him to be sleeping). We sit in the dark (or half-dark) and I narrate an account of the day we had together. It’s nothing complicated. It includes things like waking up, what we ate for breakfast, and whether we went to the pool or the grocery store, but it’s still a story, with a beginning (you woke up) and an end (and now it’s time to sleep). 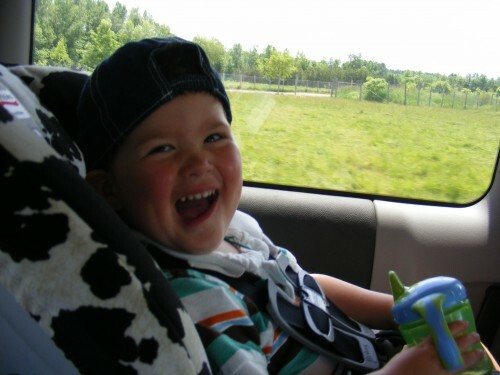 Owen, no fool, usually asks for more – not “more story” but “mo’ park?” (if we went to the park) or “mo’ baby pool” (if we went to the wading pool) or “mo’ nunning down de l’eau?” (if we let him run himself into exhaustion down by the water). So sometimes I tell the story of his day twice. It’s kind of a nice ritual, because it reinforces how much we’ve done, even in a day where all I thought we did was a whole lot of nothing. As always, I’d love to hear about your favourite books (or stories) and what helps your children (or you) drift off to dreamland. One problem with these Baby Book Club entries is that I am almost always trying to write them during Owen’s nap time (or after his bed time), which means that the books in question are usually upstairs in his room (where he is sleeping). Thus means that unless I’ve really premeditated the entry, I have to work on memory. The great thing about children’s books is that you end up reading them so many times that the words stick in your head… With Frog and Toad, it’s not the words so much as the patterns of the stories, combined with the memories of these stories from my own childhood. The "Toad and Frog" puppets my mum made for Owen's 1st birthday. Frog seems to be the more energetic and enthusiastic of the two friends, whereas Toad seems vaguely depressed and anxious. In a couple of stories, Toad wants to stay in bed to wait out winter. In one, Frog brings some winter clothes and gets him on a toboggan (with dire results) and Toad ends the story back under the covers (where he belongs). In another, Frog tricks Toad by tearing pages off the calendar just to get his friend out of bed. I often feel that my own personality is split between Frog and Toad (and maybe that’s the point). Half of me is desperately lazy and would like nothing better than to waste the day doing nothing much, but the other part of me knows that if I’ve done very little, by the end of the day I’ll feel miserable. I think in many ways, Owen is the Frog to my Toad: his very existence goads me into action. One of the other things I love about the Frog and Toad books is that Frog and Toad drop in on one another. Not only that, but Frog sometimes walks right into Toad’s house to shake him out of his lethargy. I LOVE the idea of dropping in unannounced (or having people drop in), but it seems to be a pattern that has just disappeared from my life. The only person I drop in on now is my grandmother, and that’s because she’s lost much of her memory. Partners seem to remove a lot of that spontaneity from life, not intentionally, but just because there’s another person to consider. Dropping by happened so much more when I was single – and I miss it (but not being single)… (Or is it the suburbs?) Anyway, Frog and Toad are single, so they wander in and out of each other’s lives and houses in a way that people must have had to do in a world before telephones. And though Frog and Toad are – well – a frog and a toad – they do wear clothes, so if phones existed in their worlds, they’d have them, right? I guess part of the magic of the the stories is that they are themselves nostalgic. The books are from the 1970s but are looking back to a still simpler age (pre-technology, when men and toads wore tweed everyday?) I know that when I read them, with Owen’s warm body on my lap, I remember these characters from my own childhood, and I love the palimpsestic nature of old memories and reflections being covered up by new ones (and knowing that we have many more years of reading these stories before we put them in a box and wait – maybe – for the next generation). P.S. 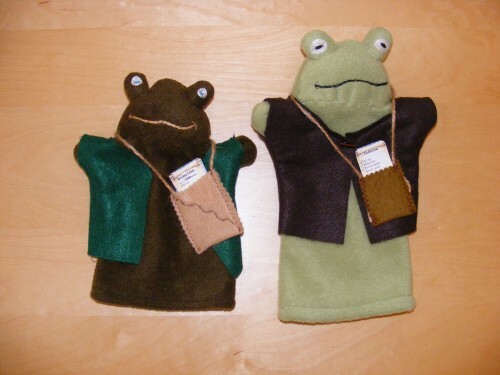 For the Frog and Toad puppets, see my mother’s Etsy shop. I hate shopping. Hate it. Hence my shoe situation. The pair of sandals I bought last year have completely worn out. The heels are gone. I have some 10+ year old sandals that I don’t particularly like. And I have pink sequined slippers. Practical! And they go with everything… And… flip flops. Anyway, I wanted to get a pair of sandals that were at once elegant and low-heeled but not completely flat and practical and comfortable and leather and under $50. Yeah. So Owen and I hit the mall last week. I told him we were going to the shoe store (without realizing how many shoe stores there were in the “big big mall”). I think I looked at every pair of sandals in the whole mall. Owen is pretty much game for anything, so in the first 3-4 shoe stores he was having fun. He tried the ladies’ shoes on on top of his sandals, pronouncing them “nice!” and generally (sort of) enjoying himself. But of course, his Mama couldn’t find anything that fit her multiple criteria, so we had to go to 7-8-9-10 shoe stores. At around 11:00 (1.5 hours into the shopping expedition), Owen started to complain “No mo’ shoe store! No mo’ shoe store!” – at 11:30 we went and had a snack: a berry oatmeal muffin and a huge glass of milk. The snack was a success. 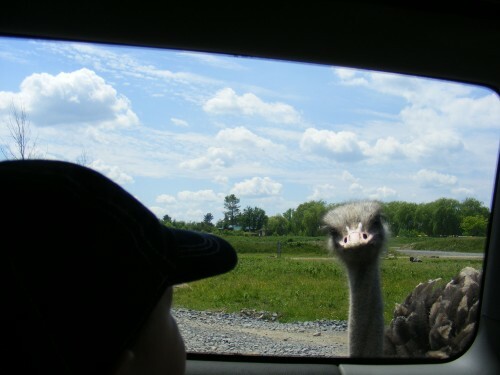 Ever since, Owen has been asking to go back to the “big-a-big-a-big-a mall” for num-nums. But when, after the snack, I tried to go back into another shoe store, he almost lost it. 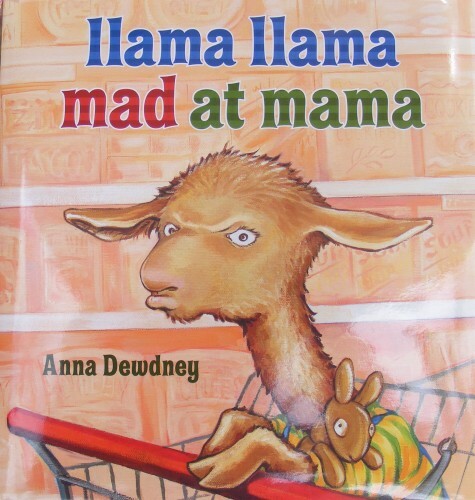 All this to say that for Owen’s birthday, Duncan bought him two new books, Llama Llama Mad at Mama and Llama Llama Red Pajama, both by Anna Dewdney . They are both absolutely perfect for Owen’s age and they somehow capture the frustrations and fears of a toddler as well as the (potential? inevitable?) abstraction of the parent. It contains useful lines you can use in everyday situations, like when your toddler starts to pout and whine to get your attention (“Little Llama, what a tizzy! Sometimes Mama’s very busy”). At some point, after trying on new socks and shoes and being asked whether he wants Cheezee Puffs or Oatie Crunch, little Llama loses it. He has a full-blown temper tantrum in the middle of the Shop-O-Rama. 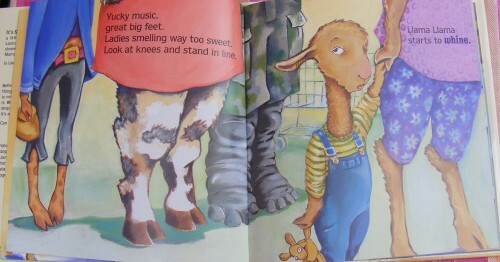 What I like about the book is that Mama Llama keeps her cool. She realises that her son is bored out of his mind, so she includes him in the activity rather than remaining aloof in her adult mind. These books are good for reminding parents what it must be like to be a toddler, without much control over activities or even the ability to express frustration beyond whining and all-out protest. Acknowledging Owen’s limits, I finally went back to the first store and bought a pair of shoes and a pair of sandals. The shoes are comfortable and will be great for fall. The sandals I have since returned. Oh oh. Looks like Mama will have to go back to the Shop-o-Rama. Actually, I think I’ll make do with $4 flip flops and shoes I don’t particularly like. 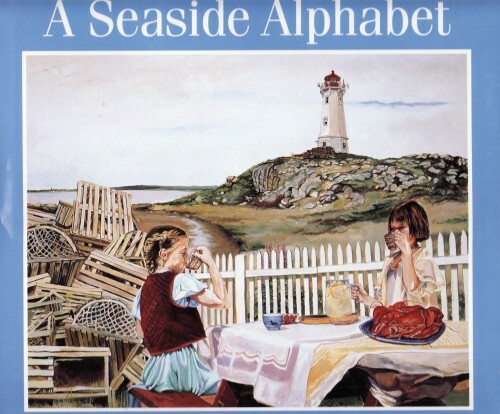 A Seaside Alphabet (words by Donna Grassby and pictures by Susan Tooke) was one of the earliest books we bought for Owen, purchased in Halifax at Woozles, a wonderful children’s bookstore still full of warm childhood memories for Duncan. 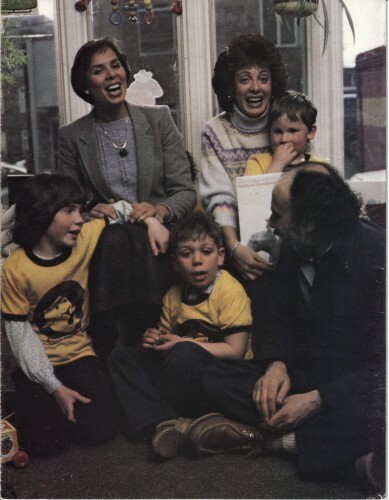 (On that note, Duncan met Sharon, Lois, and Bram at Woozles some time in the 80s… and was photographed with them – as he says, picking his nose. I think he’s just being coy). Anyway, the book was way too mature for Owen when we bought it (he was 3 months old). Recently, however, to my delight, he has started choosing it for bedtime and naptime reading. He’s excited about books that become treasure hunts, and this one has such detailed images that I keep discovering new things every time we read it. 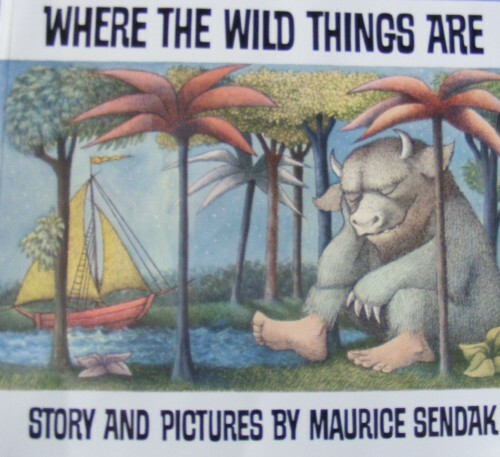 My favourite books are always the ones that the parent wants to read it as much as the child – really detailed pictures (like Peepo or 123) prevent boredom in ways that some of the “pet the fuzzy dog” books just can’t. The pictures, however, are even more fun, because in each picture there are more words starting with that letter to find (there’s a list at the back, but we don’t look much). On the “Q” page, for example, I just noticed Queen Anne’s lace and a quarter on the edge of the frame, and the little girl is carrying a quilt. 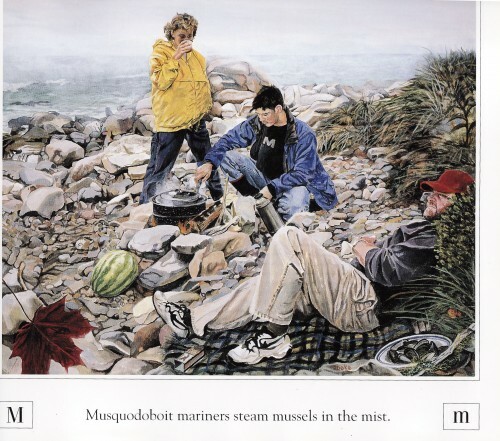 On the M page, pictured here, there’s a melon, mussels, a mollusk, matches, a man, etc. What’s fun is that while Owen might need to have something pointed out to him once, he doesn’t seem to forget, and has now started flipping between pages to find the two raccoons (one on the “R” page and another under “W” for wetland wildlife). The book also reminds me of our lovely summers past and future in Nova Scotia (where Duncan’s parents and Owen’s grandparents live). It’s especially important for Duncan that Owen forge a connection with the sea, so this book, if nothing else, familiarizes Owen with the sights and vocabulary of the Maritime landscape. We’re heading out there this summer and when we go, Owen will be well versed in words like Musquodoboit and Kejimkujik. Important, that. Owen pretty much has his basic colours down now. When we walk down to the waterfront, as we do most nights, he looks for the yellow cars (rare), orange cars (rarer), and blue cars (plentiful!). Our walks have taken a new dimension, in a way, because colour is now incorporated. 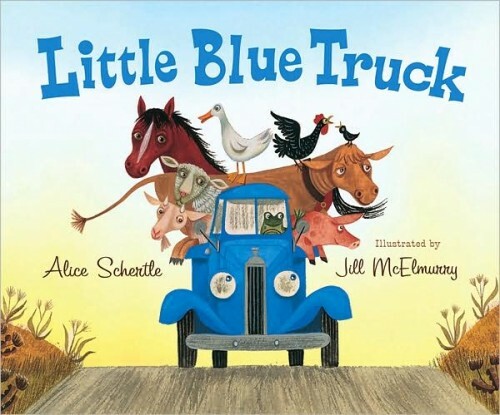 Alice Schertle’s colourful book Little Blue Truck (illustrated by Jill McElmurry) was recommended recently by the saleswoman at Babar Books in Pointe Claire. I liked it immediately. It’s perfect for Owen’s age (almost 2) because the rhymes are simple and catchy, and the book is full of creatures my little boy loves (namely, farm animals and trucks): “Horn went ‘Beep!’ / Engine purred. / Friendliest sounds / you ever heard. / Little Blue Truck / Came down the road. / ‘Beep!” said Blue / To a big green toad.” The rhymes actually work without any of them having to be forced (unlike a certain Baby Einstein book which shall remain nameless, or some of the peekaboo, fuzzy, lift the flap books. What passes as children’s poetry astounds me sometimes). The book is about a friendly truck who is kind to all the local animals. One day, a big, rude, dump truck arrives in the neighbourhood. It hasn’t “got time / To spend the day / With every duck / Along the way.” The dump truck gets stuck in the mud, though, and needs the help of all the animals he’s been shunning. Little Blue Truck has a moral, and that’s OK, but I wish Schertle had resisted the urge to spell it out for us (and the toddlers, who I’m sure could have figured out on their own that: “Now I guess / A lot depends / From a helping hand / From a few good friends.”) The other thing that I feel weird about is that I am pretty sure an old truck like Blue would be a gas guzzler, so he’d be poisoning the air of all his little farm buddies. In any case, the book is charming, the illustrations lovely, and the truck’s carbon footprint is surely not the point. 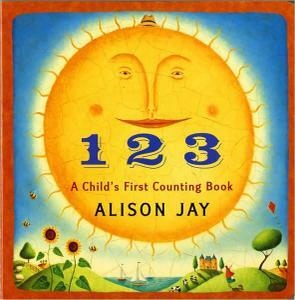 Alison Jay’s 123 is a marvel. It’s a counting book, yes, but the illustrations are magical. The more Owen grows the more he can seek and find the numbered treasures lurking on every page. The journey aspect of the book reminds me of a story told to my sister and me by our live-in neighbour Duffie, when we were small. Duffie and Debbie lived in an apartment attached to our house and since they were good friends of my parents, they parented us a little as well. Duffie was (and likely still is) a phenomenal storyteller. For one tale in particular, Erin and I would rush into his apartment before bedtime and he would pull out the map (that he expanded as the story grew). I can’t remember the details of the story at all, but I do remember the anticipation every night to hear another installment. It was a Tolkienesque story with cottages, trees, mountains, bridges, and strange creatures. Erin and I were adventurers through that world. When the narrative ended (as all stories must), I was deeply saddened, and though Duffie told us others, none took on the weight of memory as that one, in which our adventures spread across a blank sheet of paper. I wish I still had that map.